On Tuesday, May 9, the College of Liberal Arts and Sciences at Arizona State University will recognize its highest achieving students from the social sciences, natural sciences and humanities at the 2017 convocation ceremony. Each department and school within the college has selected an outstanding student who has demonstrated an unyielding commitment to academic excellence during their time at ASU. These students will be awarded a prestigious Dean’s Medal to be worn with their graduation regalia as they lead their fellow graduates during the processional in honor of their scholastic achievements. The Dean’s Medalists have made significant strides in their academic careers. From advanced coursework and honors theses to innovative research and consistently high grades, there’s no doubt each of these students will make impressive contributions to society and the world after graduation. Accomplishments: Almhjell has been an exemplary student and researcher during his time at ASU. He has been conducting research in Professor Jeremy Mills’s biochemistry lab and Professor M. Foster Olive’s psychology lab since the fall of 2015, where he investigates amino acids and behavioral neuroscience, respectively. He has also maintained a perfect GPA as an honors student and served as a teaching assistant for upper-division chemistry and psychology courses. Future plans: Almhjell plans on going to graduate school to further his career in science. He has been invited to interviews for graduate programs at Caltech, Stanford and the University of Washington. “Patrick exhibits myriad characteristics of successful scientists including great tenacity, a scientific intuition that often borders on prescience considering his limited experience, an incredible work ethic, a good demeanor in the laboratory and a terrific intellect,” said Jeremy Mills, professor of biochemistry in the School of Molecular Sciences. Accomplishments: Bayham’s time at ASU has been academically excellent and professionally productive. She served as an intern for the City of Phoenix Planning and Development Department for six months before starting a position there as an engineering technician, which she has been doing for more than a year. She also studied abroad in the Mediterranean, learning about the design and urban planning of Spain and Italy. Future plans: Bayham is already in the process of pursuing a master’s degree in urban and environmental planning at ASU. She is expected to graduate from her master’s program in May 2018. “Amanda is driven to study urban planning not just to develop skills to qualify for jobs but to improve the quality of life in Arizona, where she grew up. She has a growing passion for planning for infrastructure, such as place-making along canals, and housing,” said Trisalyn Nelson, director and foundation professor in the School of Geographic Sciences and Urban Planning. Accomplishments: Ortega is a very successful first-generation college student. He has had experience in the real world of politics and in academia. He was first a research fellow in the Political Science Junior Fellows program under Gina Woodall, professor of political science. Then, he earned a full-time internship at the Arizona Democratic Party as a staff policy intern. Ortega was also chosen this year for the Alumni Association Outstanding Graduate Award. Accomplishments: Doctor is a successful transfer student whose commitment to American Indian issues and helping others has driven his education. He is a social worker for the Salt River Pima-Maricopa Indian Community Senior Services, where he helps seniors and vulnerable adults. Doctor is also bilingual in Navajo and English. Future plans: Doctor plans on pursuing graduate studies in either social work or public administration, with the long-term desire to serve Indian communities and to promote Indigenous cultures, languages, education and economic growth. “Adrian is lifelong learner who will use the knowledge and skills he has acquired in American Indian Studies, academia and life in general to address a wide range of problems and concerns facing Indian nations,” said James Riding In, associate professor and interim director in the American Indian Studies program. Accomplishments: Garcia is a driven student of language and business. He has distinguished himself at ASU through his near-perfect GPA and varied extracurricular activities. He studied abroad in Lyon, France, at the Centre International d'Etudes Françaises. He also prepared and managed a $700,000 budget for a property management firm, where he worked as a property manager for four years through college. Volunteer work: Garcia has volunteered as a Spanish-English interpreter for medical outreach doctors and staff at Calvary Community Church in Cayo, Belize. “It was clear from his performance that Mr. Garcia is a careful and sensitive reader, a fluent writer with an eye for detail and an extensive vocabulary, and that he takes learning seriously. Indeed, his command of French is exceptional for an undergraduate, non-native speaker, and speaks to both his intellectual ability and his discipline,” said Mark Cruse, associate professor and head of the French and Italian faculty in the School of International Letters and Cultures. Accomplishments: Gonzalez’s academic career has been marked by a deep drive to help others. Gonzalez has gone above and beyond her standard coursework in learning how to help communities in need. She was the co-founder of the on-campus Peace Corps Club and contributed more than 100 hours of community service to get her Peace Corps Prep certificate. She is also the director of advocacy for El Concilio, an on-campus group that seeks to empower Hispanic students through workshops and activities. Future plans: Gonzalez will be going to Peru this year as a Peace Corps health volunteer, where she will spend the next two years helping a local community there. “There is no doubt that Breanna is an exceptional student, who will continue to be successful and have a positive impact on the community she will serve in the Peace Corps in Peru post-graduation,” said Alejandro Lugo, director and professor in the School of Transborder Studies. Accomplishments: Hardin actively helps her community by applying the skills she has learned in college. Aside from her excellent performance in coursework, Hardin worked as a care provider for Aid to Adoption of Special Kids, an organization that provides in-home habilitation and respite services to children with developmental disabilities. She also worked as an intern for Homeward Bound, where she helped promote resiliency for children with emotional, behavioral or other delays. Volunteer work: Hardin has been a student leader in her school for more than a year. In that position, she introduces freshman to the school and promotes student engagement through a variety of activities. She also volunteered at the Tempe Community Action Agency to help the homeless, poor and elderly. “Maggie approaches all tasks with a positive attitude and seems to view her responsibilities as opportunities to learn new skills. Her work and attitude have been so impressive that we asked Maggie to take on more leadership roles within the lab that typically would be reserved for graduate students,” said Cindy Faith Miller, undergraduate director in the T. Denny Sanford School of Social and Family Dynamics. Accomplishments: Ireland is a diverse student who has made learning her main priority. She graduated valedictorian from her high school and was a merit finalist before even arriving at ASU. Since being here, she has maintained a perfect GPA, conducted physics research in Germany at Albert-Ludwigs-Universität Freiburg and wrote a compelling honors thesis. Future plans: Ireland got top-notch scores on the GRE Physics Subject Test, setting herself up to get into elite graduate schools both nationally and internationally in order to do a doctorate in physics. “Her reports were a pleasure to read and indicated a real depth of understanding of the underlying concepts. Her academic performance was perfect, and I would rank her in the top 1 percent of all physics majors I have taught in the past 10 years,” said Martha McCartney, professor in the Department of Physics. Ireland was also chosen this year for the Alumni Association Outstanding Graduate Award. Accomplishments: Martin is a high-achieving honors student who has maintained a perfect GPA at ASU. He has performed with excellence in all of his philosophy studies, and he has given immense energy to considering some of humanity’s most perplexing questions. Future plans: Martin plans on pursuing a PhD program in philosophy, for which he has already been admitted to several programs. “Jacob’s work in philosophy, and in every other area he has studied at ASU, has been uniformly outstanding. He has wide-ranging interests, and he pursues them all with exceptional ability and with a passionate investment of intellectual energy,” said the nomination committee from the School of Historical, Philosophical and Religious Studies. Accomplishments: Norwood has been recognized for her excellence and awarded several prestigious scholarships, including the Donald C. Johanson Undergraduate Research Award and the Origin Project’s Undergraduate Research Scholarship, among others. Norwood has also served as president of the Undergraduate Anthropology Association since 2015. She has done lab and field work in both geological studies and archaeology. Future plans: Norwood anticipates doing graduate work in paleobiology. “Alex was the top of the class among undergraduates. Her performance rivaled that of the graduate students. Alex did outstanding work on all the projects and communicates well, both verbally and in writing. But what really impresses about Alex is her ability to reason through complex problems, making connections to concepts discussed previously,” said Kelin Whipple, professor of geomorphology in the School of Earth and Space Exploration. Accomplishments: Poisson is an excellent student and researcher. Aside from maintaining a perfect GPA, she has been involved in university-level research since she was a high school student in Heather Bimonte-Nelson’s neuroscience lab. She has been published for her work in that lab as well as having been cited in several major neuroscience conference abstracts. Volunteer work: Poisson has been volunteering at ASU Brain Awareness events since August 2013. She has also been volunteering as a member of Omega Phi Alpha, a national service sorority that participates in various service projects in the community. “Based on her current productivity, Mallori's curriculum vitae will include at least five co-authorship publications by the end of next year, including a lead author paper from her honors thesis work. This outstanding publication record is equivalent to what we expect from a top-performing master's level student,” said Polemnia G. Amazeen, associate professor in the Department of Psychology. Accomplishments: Rafidi, aside from being an exceptional honors student, is already a scholar in her own right. She was first author on two anthropological publications and gave a presentation at the Society of American Archaeologists 81st Annual Meeting in Orlando. She is also working as a freelance writer/translator and tutors in linguistics at the Southern Arizona Association for the Visually Impaired. Future plans: Rafidi intends to pursue a doctorate in linguistics with an emphasis in sociolinguistics, linguistic anthropology and discourse analysis. “Brianna is an enthusiastic learner. Not only does she seek out opportunities to grow in the field, but she shares what she knows with others and invites them along on the journey. Brianna has packed more into her four years at ASU than most other students achieve in twice that amount of time,” said Rafidi’s nominators: Laura Tohe, professor in the Department of English; Linda Sullivan, assistance director of academic services in the Department of English; and Robert Sturges, director of undergraduate studies and professor in the Department of English. Rafidi was also chosen this year for the Alumni Association Outstanding Graduate Award. Accomplishments: Rajnisz is an accomplished transfer student who has always taken pleasure in volunteering. She volunteered to help oversee the Tempe Festival of the Arts last year. She has also been a stylist for Sun Devils Wear Prada since 2015. Rajmisz is bilingual in English and American Sign Language. Volunteer work: Rajnisz has volunteered at Maggie’s Place, which provides pregnant women in need with resources and a supportive community. She has also coordinated several events. “Amy is a very conscientious and focused student. 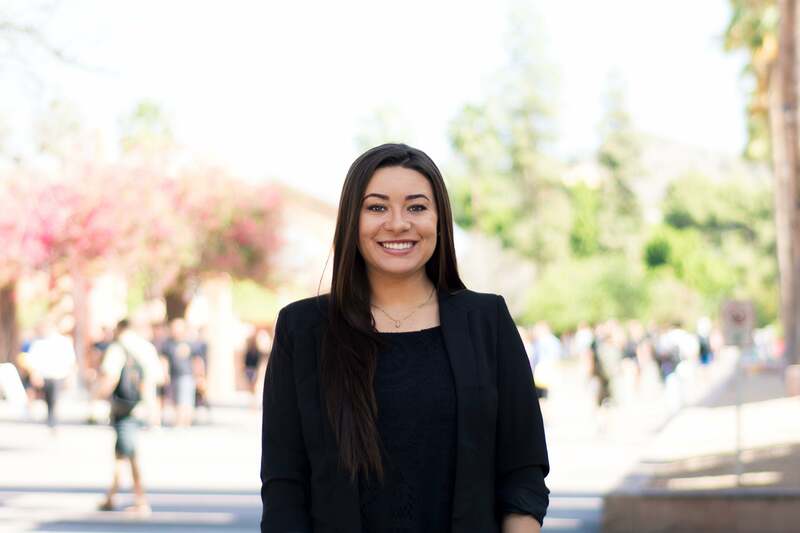 She managed to overcome many obstacles and challenges — all while maintaining a positive attitude and continuing to work on hard on her academic achievement,” said Misa Pham, assistant director of the Hugh Downs School of Human Communication. Accomplishments: Rocha embodies the active Sun Devil. She has been involved with a wide range of extra-curricular activities, all while maintaining a high GPA. She is the president of the Pre-Law Society at ASU, which she founded and which grew under her leadership from five to more than 60 members. Volunteer work: Rocha has volunteered with the ASU Clothesline Project. She led initiatives to increase awareness of domestic violence and break the stigma and stereotypes surrounding victims. Future plans: Rocha has been admitted to the University of California-Berkeley School of Law. “Throughout her studies at ASU, Caitlan has been an outstanding student, not only academically but also in her dedication to her extra-curricular activities as a proud Sun Devil in positions of leadership,” said Frank Piña, senior coordinator in the School of Social Transformation. Accomplishments: Sargent’s time at ASU has been highly productive and tightly focused. Since 2014, he has been working on research into the aging of the Drosophila in Professor Jon Harrison’s lab and has made significant strides in that research as well as given presentations at conferences. Volunteer work: Sargent volunteers at the HonorHealth hospital. He is also a project developer for the First Gen Scientists organization, which helps get kids interested in science. Sargent is working to develop a microbiology quarter for the program. Future plans: Sargent plans on becoming a physician scientist by pursuing both an MD and PhD. “James is the whole package; his undergraduate research project will end up being similar in depth and independence to most master’s [students’],” said Jon Harrison, professor in the School of Life Sciences. Accomplishments: Theisen is a highly accomplished and driven student. He was awarded the Fulbright Scholarship to study the history and legacy of the trans-Atlantic slave system in the United Kingdom during the summer of 2014. Furthermore, he is the co-founder and director of data science of Veratox LLC, a research associate at the Luminosity Lab and president of the Lambda Chi Alpha fraternity. Future plans: Theisen plans on completing a master’s degree in mathematics, followed by a doctorate. “Ryan has one of the highest cumulative grade point averages among the graduating majors in any of the school's undergraduate degree programs. What makes Ryan’s academic work stand out is that he earned these top grades while taking the most challenging courses,” said Theisen’s nominators: Matthias Kawski, chair of the School of Mathematical and Statistical Sciences Committee; and Don Jones, director of undergraduate studies in the School of Mathematical and Statistical Sciences.